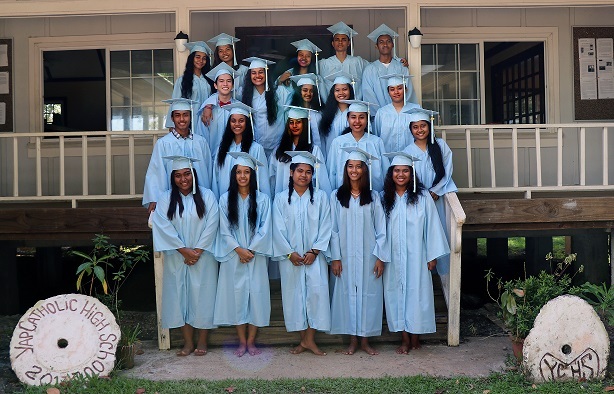 The transition of leadership from the graduation Class of 2018 to the rising senior Class of 2019 was performed by Renee Rhonalynn Choorang and Jennaia Chonmon. The Commencement Address was given by Francis Itimai, Director of the Department of Youth and Civic Affairs for the State of Yap. Principal Michael Wiencek then gave his final address to the Class of 2018 before the graduates officially received their diplomas. Following the conferral of diplomas, Fr. John Mulreany, S.J. blessed the graduates. The ceremony concluded with a final word from Fr. Jack Mattimore, S.J. where he thanked Fr. John Mulreany, S.J. for his seven years of service to the school serving as a co-founder, teacher, counselor, and assistant director along with serving the pastoral needs of the Catholic Church of Yap. See our Facebook Page for more photos of the event.